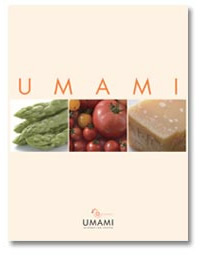 New UMAMI leaflet offers a comprehensive and updated knowledge on the fifth basic taste, umami with informative figures and beautiful pictures. 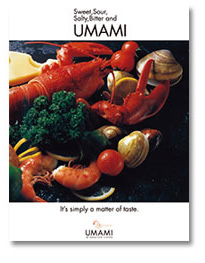 On this occasion, we revised umami world map which covers a number of umami rich foods around the world. 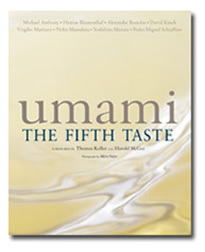 Also in the section of experiencing umami for yourself, you will find a simple method for tasting umami. Newly added section of three properties of umami and its application and FAQs will help your further understanding of the fifth taste. We prepared both in English and in Spanish. Please check the contents. Where can we find umami? Newly updated, this informative guide compiled by the UMAMI Information Center in Tokyo adopts a slightly more scientific approach to umami. Its short, easy-to-read paragraphs will guide you through the history of umami, how, when, and by whom it was identified and defined, as well as recent scientific discoveries about the ways in which glutamate - one of the essential components of umami - is detected by the body, and the implications that this insight has for the study of umami - and of food in general - in the future. 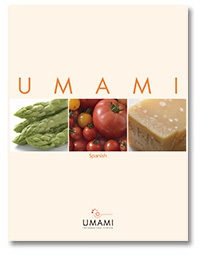 This publication provides an extremely useful source of reference for anyone who would like to know more about umami. 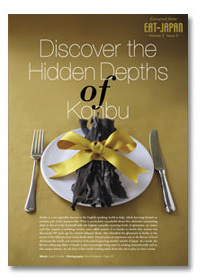 This handy eight-page brochure invites you to the world of umami and kombu. Presenting special recipes, three well known chefs share their thoughts on umami. 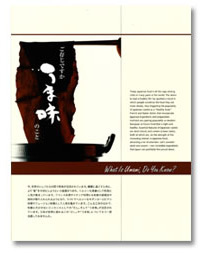 The quaternion leaflet features umami and dashi with a plenty of charts and pictures. Written in bilingual, Japanese and English, this double-faced flyer introduce you umami as indispensable factor in Japanese cuisine. 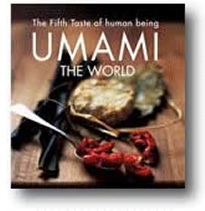 UMAMI THE WORLD is an invaluable publication, available in English, French, Japanese, Portuguese, Spanish and German, which provides factual information about umami, its history and usage, in an easy-to-read format. This book introduces and explains the use of umami in both Eastern and Western cuisine, giving many varied examples of its sources in nature, as well as similarities and differences in its usage around the world. The reader will surely be surprised to find out just how often umami naturally appears in our everyday diet and how we have all been enjoying it unbeknownst to ourselves! This compact recipe book is the first in a series of publications presenting umami seasoning recipes from all four corners of the globe. 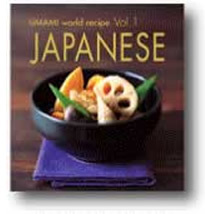 The first volume focuses on the world famous cuisine of Japan and provides a wealth of easy to prepare recipes which will leave you the envy of your family and friends. These simple recipes will encourage anyone who has thought about preparing a traditional Japanese dish, but who was too scared to try, to actually have the confidence to get into the kitchen and have a go for themselves! You will be amazed at the simplicity of these recipes, the easy-to-follow instructions and the wonderful results which can be obtained! 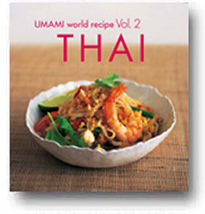 Volume 2 o f the Umami world recipe series takes you on a journey of taste to the exotic climes of Thailand, introducing you to a wide selection of the country’s most delicious dishes, all of which take full advantage of umami to boost flavor. Each recipe provides simple step-by-step instructions, and is lavishly illustrated in full color, to give you a clear idea of what the finished dish should look like.